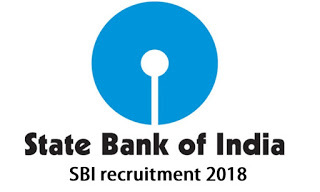 SBI Recruitment 2018 for Specialist Cadre Officer @www.sbi.co.in : State Bank Of India (SBI) has released a notification for the recruitment of 121 Specialist Cadre Officers as Managers and Chief Managers in various departments. Interested candidates may check the vacancy details and apply online from 16-01-2018 to 04-02-2018. More details about SBI Recruitment 2018, including number of vacancies, eligibility criteria, selection procedure, how to apply and important dates, are given below.. Candidates should have passed CA/MBA/PGDM or equivalent Post Graduation Degree from a recognised university. Selection of candidates will be made on the basis of Personal Interview. Interested and eligible candidates may apply online through SBI website - https://www.sbi.co.in/ - from 16-01-2018 to 04-02-2018. Candidates may also send their application form along with photocopies of relevant certificates and identity proofs with passport size photographs to State Bank of India, Central Recruitment &amp; Promotion Department, Corporate Centre, 3rd Floor, Atlanta Building, Nariman Point, Mumbai-400021" before 12-02-2018.